Renaissance Houses at Slavonice is part of the Tentative list of Czechia in order to qualify for inclusion in the World Heritage List. Because I grew up in nearby Jihlava, I visited the town of Slavonice many times, usualy in a one day trip together with Telč (WHS already), thus I can compare. Slavonice are located very close to borders with Austria, and it is quite remote place accessible by rather infrequent train connection (6 per day from Jihlava). The train passes through other interesting small towns that are worth-visiting: Třešť (castle, jewish quarter and cemetery, uncle of Franz Kafka lived here), Telč (magnificent WHS), Dačice (another pretty town, with the monument that a sugar cube was invented there), and the final stop Slavonice. The train used to continue to Austria, but rails were pulled out after WWII and never set again. Slavonice has small and very compact historical core of prolonged shape with the block of houses around the church in the middle. This round structure divides the town into two squares: the larger one (photo) is somehow simillar to that of Telč, but it is much smaller than in Telč. The smaller square is maybe the most impresive part, because many houses have a vast sgraffito decoration on their facade dating back to 16th century. 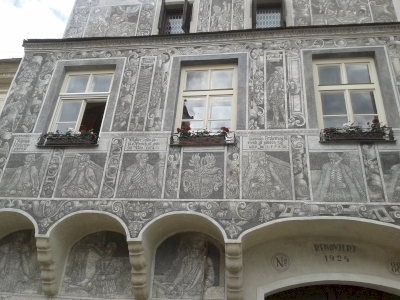 The sgraffito is not only ornamental as can be seen in many towns of central Europe, but also figural inspired by Biblical stories in line with protestant atmosphere in Slavonice of 16th century. Therefore, the main quality of Slavonice can be found in its houses, which are maybe finer those in Telč. The title of the nomination calls them as renaissance, but I would prefer late gothic influenced by Italian renaissance. Furthermore, the houses have not only preserved their facades but also the interiors are very nice and of high quality with fine late gothic detaills (vaullting) and frescoes from 16th century. Even though the houses of Slavonice are beautiful, I do not support their inscription, because there are of rather national importance without OUV. While Telč combines several qualities (square, castle, ponds around, etc.) into a unique ensamble with OUV, I cannot find it in Slavonice. One of my favourite small towns in Czech Republic. Plenty of medieval houses and also of course of later origin (hence renaissance houses), old town is small and fully enclosed by town walls. Located nearby - heritage site of Telc - is much, much bigger. Regardless of being listed or not it is the place to see. Just enjoy it!